There is, of course, a story. I write a weekly email magazine called This is True®, which tells true stories about how stupid and weird people can be. It’s pretty popular — there are tens of thousands of online subscribers. The British Tomato Growers’ Association encouraged its members to try using feng shui, an ancient Chinese practice to create harmonious environments by channeling energy flows, to increase the yields of their gardens. That didn’t sit well with two employees at Arreton Valley Nurseries on the Isle of Wight. “It put me in conflict with my faith,” complains Martin Kelly, who quit the nursery and took his son Paul with him. “I’m not working for a farm that openly claims it relies on a power other than God.” (Reuters) …You mean like the sun? The opening page said something about a reader telling me I was going to hell for writing that story. Now, nevermind that feng shui is decidedly not a religion; it certainly isn’t “anti-Christian.” Anyway, there are two groups of professionals that seem to be over-represented on True’s distribution list: lawyers (now there’s a group that needs GOOHF cards!) and the clergy. And just who do you think made the sun? I’m not the only one on your THIS IS TRUE list that believes in God. In any event, you should not write blasphemous things when sending out your e-mails. The [story] is grossly irreverent toward what is held to be sacred and there was absolutely no good reason for you to write it in the first place. God… forgives you, I’m sure. You just know any better [sic]. Get back to me some time after you’ve had a near-death experience and let me know then whether or not you believe in God. God is watching you — I don’t have to. Gee, thought it was Santa Claus who is watching me, making sure I’m good! Anyway, like an idiot, I thought this woman signing her name as “Santa” might be moved that True’s Official Consulting Pastor, the Rev. Rus Jeffrey, senior pastor of a Methodist church in New York, not only didn’t object to the story, but told me he “laughed out loud” when he read it. Please have your “Senior Methodist Pastor” e-mail me personally on what he said to you. Dear Rev. Rus, (yea, sure — and I’m Santa Claus), you have to admit is that a grave sin was committed against the First Commandment by inferring that the sun is a god. [HUH? -rc] If you do not know it, you need to go back to the seminary and study some more theology. Why would anyone believe what Randy says when he can so freely can commit a grave sin against God. Just because Randy is a friend of yours, is no reason to side with him and damn your own soul into the pits of hell, which is where you are heading. Jesus is God. And finally to answer Randy’s question “did it ever occur to you — you who insist that God made EVERYTHING — that God made feng shui, too?” Yes, Randy, I did think of that, but feng shui is not God and neither is the sun. Clearly “Santa” has been going to church for a long time — she has learned how to talk respectfully to a man of the cloth. (Of course, I’m sure it’s just some sort of cosmic coincidence that “Santa” is an anagram of “Satan”, but I digress.) You read the story; I’m not sure where she got the idea that I said the sun was a god, but you have to remember: she’s a fundamentalist — therefore she is right. Uh huh. And she is the one appointed to decide who is going to hell. Riiiiiiiiiiiiight. A human being should not being saying such things to others, especially a “Senior Methodist Pastor” from THIS is TRUE. That definitely was not very Christian of you!! Was it??? Look in the mirror, Santa, and ask that question again. Wait! Stop! What Does This Have to Do with the Cards? Patience, dear reader! A good story takes time. But don’t worry, I’m just getting to that. When “Santa” lost it in a fit of fundamentalist fervor and told me I was going to hell, I had 2,000 cards printed. I then told my readers this whole story and said if they wanted some, send in a dollar and I’d send them 10 cards — the idea being to cover the cost of printing and postage. This stack of mail represents just one weekend’s worth of orders during the initial flurry — about 3,500 cards going as far as Australia. 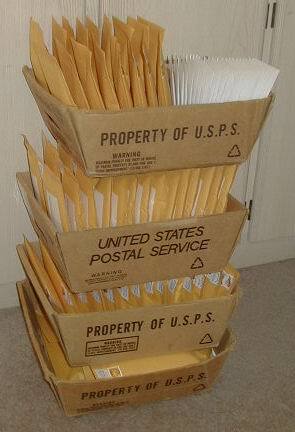 As many as 12,000 cards have been mailed out in just one week. My readers went wild for them. I figured those 2,000 cards would last for months. They were gone in three days — and that was a time when people had to mail their order in! I had 2,000 more cards printed — and they were gone in four more days — 4,000 cards just in the first week. I boosted the print order to 5,000 cards, then later 10,000, and then 20,000 at a time. The printer thought I was nuts, but the cards were going out the door that fast. “Santa” wasn’t the only one to write letters, either — I’ve received hundreds from people telling me how much they — or their recipient — love the card. Dropping a card on someone is incredibly fun, and the stories the givers have to tell are hilarious — and many times very touching. As time went on, we’ve come out with several more GOOHF products, which you can see in my shopping cart.